Click here to buy cheap bus ticket online for your Raya balik kampung trip using our exclusive discount promo codes! Book your bus tickets online now before all bus tickets sold out! Getting my primary education in a developed city, I easily got access to various reading materials & being taught by skillful and creative teachers. Hence, English (as well as other subjects) had been my favourite subject since I was seven. But the fact is, when you are studying in a city school, most of the kids there are really, amazingly clever. (Well, I guess it’s because they’re genetically clever since their parents are either doctors, engineers & have whatsoever jobs that need a good university education. My second theory is, since their parents are mostly graduated from universities, their children had been taught at home earlier before they enter the school.) .The competition was really tough to get number one in the class list whenever there’s examination. So, I was considered as an average student with a high potential to be more successful (as stated in my report card :p ) though I was in the first class out of five at that time. But, hey! Such thing had never been in a thinking of the 7 years old kid! The only thing that I cared was that I love going to school & learn new things everyday (though I don’t like doing homeworks :p)! And for sure, I had a good time playing with my friends and doing crazy ‘kids things’ that will make my parents angry. Everytime there’s examination; I’ll try to do my best & then hoping I don’t get the 15th and above position in the list. That was my target because I knew my classmates would do better than me. Teheheee…. When I was eleven years old, I changed school. That was mainly because my family had moved to my mom’s hometown for several personal reasons. So my status from a ‘city kid’ (budak bandar) had changed to a ‘rural kid’ (budak kampung). Making friends at the new school was never a problem for me at that time. Well, kids get along easily, right? Besides, all new students will easily be known by the entire school because they are the ‘new faces’ there. But, what shocked me the most is that (yes, I could hardly believe it up until now!) I was considered as one of the cleverest student in the school! Yes, you don’t get it wrong; I was among a few of the top scorer at the new school back then. Though the fact is, every time there’s examination, my marks were still merely the same as what I got at the previous school, which is between 70% - 90%. Only a few times I got more than 90%. But still, in my new school, I was considered as a very clever student & I quickly become well known among not just the students, but also teachers and parents! (Fact: Everything is quickly wide-spread when you’re living in a village). But one thing that they amazed most about me is that, I have a good English skill compared to the rest of them. Of course, when I was in the previous school I had never been considered like that. (I’m saying this as a matter-of-fact, not to show off, & the English skill that I mentioned earlier only applied to my writing skill. There’s no oral test in UPSR right? Hehe). Hence, I became their second reference person after their English teacher every time we got English homework. Then, the next ‘surprise’ came. Some of my friend’s moms met me personally & asked me to help their child with English subject mainly, as well as other subjects of course. Ok, I got no problem with that. I’ll try & help whenever I can. But, the next request made me fell silent at first. They ask me how & what did I do in order to excel in my English. At first, I was like, “Oh my God! How should I know?? I just did whatever my teachers asked me to do back then in the previous school, & when I came home after school, my mom will help me to reinforce whatever that I had learned that day”. However, I only keep such answer to myself & replied them, “Ouh, sorry I really don’t know”, and smiled shyly. But as that question become more frequent, I usually replied by telling them I love reading books and my family will usually bought me English storybooks apart from my mom become my teacher at home. Well, that is half true because I think the major contributing factor at that time was the environment itself. I mean, I was surrounded by creative & experienced teachers, have lots of reading materials (storybooks, magazines) easily available from various bookstores & school library as well as my friends themselves at that time. Compared to the new village school, I can see that the teachers weren’t that creative & I can hardly found bookstores here. If I want to buy any books, I’ll have to ask my dad to bring me to the nearest town. But still, the reading materials & books available were very limited. Some of the magazines that I usually bought when I lived in the city such as ‘Kuntum’ & ‘Dewan Pelajar’ were hardly to be found. And if there’s any, it was usually outdated by a few months back & the latest issues were not restocked yet (or they don’t restock it anymore, I’m not sure with that). Library? Forget it. It was just almost the same as the bookstores that I told earlier. So, what choice do these kids have to improve their English? After getting 5A’s in my UPSR, I went into a religious school to continue my secondary education. This school is still in the same district with my second primary school. But since in this school, students came from all around the state, I became an ordinary student again. Yippieee!! (The truth is I hate being famous in my 2nd primary school because of various reasons.) However, for English subject I was still considered as among the best student. To cut the story short, I was still considered as a reference person when it comes to English until I finish my SPM. Alhamdulillah, all praises to Him, I managed to get the JPA’s scholarship after I finished my SPM. It was something beyond my imagination because even from the beginning I realized there are thousands more candidates who are far better & eligible than me. Even during my secondary school years, I’m just an average student although I was placed in the first class. From even the beginning (since my secondary years to be precise), I knew that I’m only good in writing. As for speaking, I had never been much exposed with this skill ( since all my family speaks Malay) & even when I want to try to speak in English with my friends, they’ll give me such a look that will make me think, “Ouh, never mind. Just do what other people do, you won’t draw their attention & you’ll not be ridiculed. End of story.” I know it wasn’t a good mind set, but I don’t think I have much choice at that time. So upon entering the college that I’m studying now, I realized I can & I have to upgrade my English skill. Because; one, there are many students here from all over the country who can speak in English very well, & it had even been their main language. So, it is safe if I want to start learning to speak in English even I was quite shy at first, because I need to take a baby step. But since everyone are so supportive (my classmates especially), I had gain my confidence now to speak English, even at times, I got stuck & my tongue got twisted. Hehee... Secondly, the fact that I’m going to continue my degree in NZ & need to sits for IELTS had been a stronger driving force for me to upgrade my English skill. And during my second semester here, which had just ended a week ago, we’re focusing on speaking & writing components of the IELTS. And Alhamdulillah again, I managed to get band 7 over 9 for my speaking tests. This kind of things makes me feel confident that everything can be achieved as long as I trust in myself & work hard for it. Being in this college also makes me realized that there’s always rooms to improve myself, be it in terms of my English skill or other aspects as well. Since there are a lot of people who are far better than me, I can always make them as my indicator to know which level I am and how much I need to improve. And I know this time; I wouldn’t be ridiculed if I’m trying to change for the better, which make me feel really grateful with my decision last year to continue my studies in this college. READ: Yeah, I know you guys might already feel bored with this word, but no, I’m serious. Reading does not just limited to books, novels & magazines, but newspapers, blogs and websites as well. I even actually read the English subtitles whenever I watch Malay dramas or movies. Trust me, it is very fun! SING A SONG! : This is another way to make your tongue familiar with the English pronunciations as well as adding your vocab. Of course when you’re singing you’ll find new words that you’ve never heard of before! So you’ll get the same advantage as the first & second tips when singing. 2 in 1! I think that’s enough from me now. Though I know I had been writing too much and I’m not even sure if there’s anyone going to read what I’m writing up until this point, but if you do, lots of thanks & hopefully my writing will benefit someone out there even if it’s only a little. 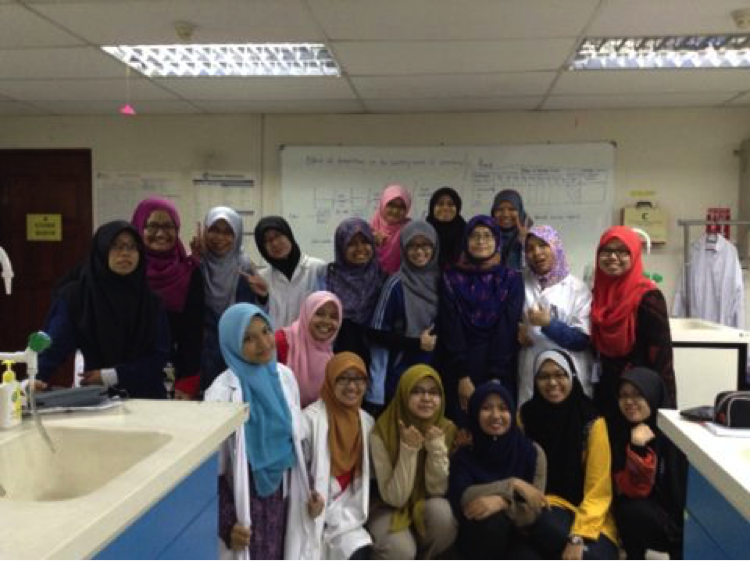 Last Biology lab experiment for the 2nd semester. I’m at the front row wearing light blue scarf with a lab coat on. Ahh well Atiqah! Good job and it seems that perseverance took an important role along your journey in mastering eng! 3. Write more, as cliched as it sounds. Start a blog, or write for your school magazine, or just write some stories just for yourself to read.